To Make a Great Content which is worth spending time on reading, all you need is some time to think and gather content for your ideas. You need to be relevant on writing about such topic and should not go AWOL. I wrote about How to write Quality Content in 3 Steps last month and I just wanted to include an infographic on to my blog about creating great content in a simple way. I was hunting on the internet for hours about this topic and I finally got a perfect Infographic which I literally found on Pinterest pinned by dr4ward that was originally posted on Lindon East. I really can't say more to it as this infographic tells everything that you wanna know about writing an awesome content worth reading. Having a big idea about a topic and digging about the Internet Market for right customers and right time to post is the key for a great content. Sharing is a different key factor where you have to do promote all the time and make use of everything you can. 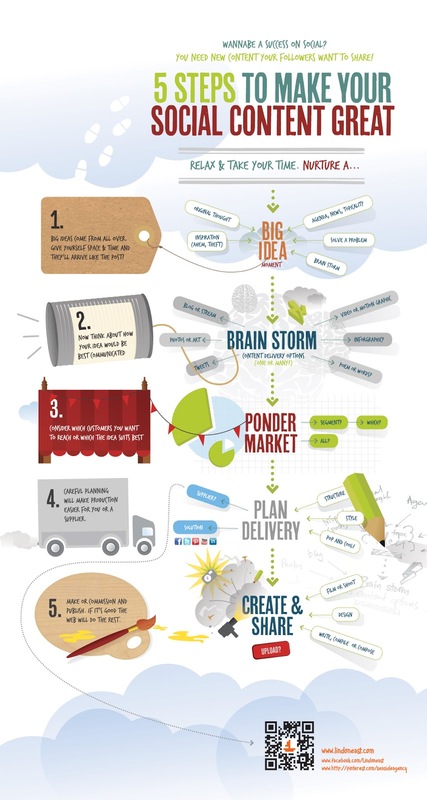 Here's to you the infographic on 5 Steps to Make Great Content.